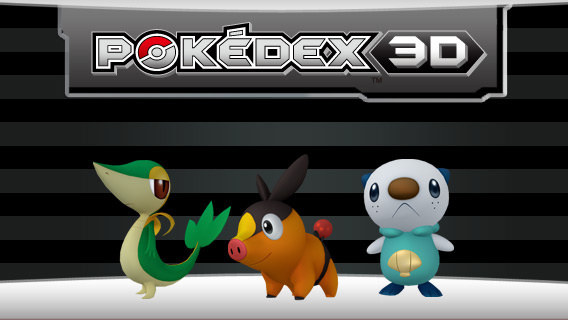 Unlike Excitebike's temporary free price of admission, Pokédex 3D is free for the foreseeable future, so there's no real reason for Pokéfans not to give it a fair shake. In fact, it's surprisingly well featured for a freebie, making use of many of the console's features to bring the critters to life. First things first: currently this is a Pokédex for Pokémon Black and White only, so don't expect to see good ol' Pikachu anywhere. There are 150 creatures in total, but as is customary you have to earn them, not through battling or catching but by using the console's communication features. It's possible to give and receive monsters via local wireless, or you can receive extra downloads for free via SpotPass, with a maximum of three creatures per day spinning the whole catching 'em all experience out for a pretty long time. There's no actual gameplay involved in filling your 'dex, but as always the key is sharing the wealth between players, and that's definitely A Good Thing. Once you've got a monster though, what can you actually do with it? You can view it from all angles, watch it perform a short animation and change the background scene, but this is more than a simple 3D viewer — it's a sizeable compendium of Pokémon information, going into impressive detail on each monster. Want to know what moves your Pokémon will learn and how, or how its statistics measure up against other monsters? This is where the 'dex comes into its own as a reference tool, and although it doesn't offer some of the features users may be used to finding online — Effort Values and Individual Values are nowhere to be seen, for example — it offers a well-rounded array of facts and figures to inform and, occasionally, entertain. You're also able to search the 'dex for a specific move, weighing up each attack's accuracy, damage and more, with a useful list below of who learns what and when. Don't know the name of the move you want? You can search by type — Poison, Dark etc. — or kind — Physical, Special, Status — or simply by the first letter of its name. It's not a bad system all told, although if you want to sort by statistics, all moves with a power rating of over 100, for example, you're out of luck. If you find a monster or move you want to remember for the future, you can add a quick bookmark for up to 16 of each, which should help you out in a rush. It's certainly more efficient than folding down the corners of a traditional strategy guide, which is the market this application is going for, although it has the disadvantage of not being able to play the DS game and check this simultaneously. Should you not be content with viewing your monster within the confines of its Pokémon-y world, you can bring it into the real world with the use of an AR marker. 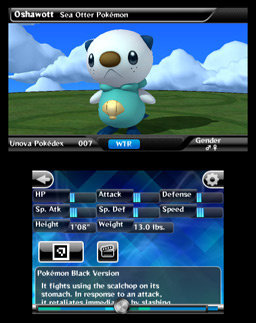 A cross between the 3DS QR code and the machine's Augmented Reality games, each monster has a unique code that, when shown to the console, brings the Pokémon to life as a fully animated 3D model. 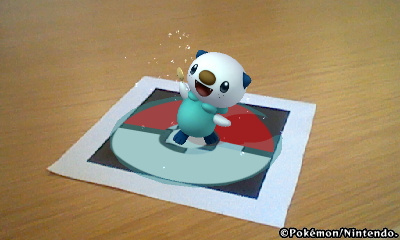 From here you can snap a photo — not in 3D, sadly — or skip straight to its Pokédex page, and there's some opportunity for creating Pokémontages for imaginative folk, though the range of animations and options is limited compared to the machine's built-in AR mode. Understandable really, considering the 150 monsters included. 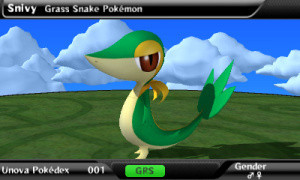 In fact, the 150 monsters rendered in 3D is a tantalising glimpse of what's to come: we know that a pseudo-sequel to Pokémon Rumble called Super Pokémon Scramble is due out in Japan in July, but of course the prospect of seeing these animated 3D models in another adventure is too alluring to ignore. If you like Pokémon and you have a 3DS, chances are you've downloaded this already as it's free, but if not then now's the time to grab it. A nice complement to Pokémon Black and White, fans will enjoy seeing their monsters in 3D and find a decent array of information included, with the delivery of new content via SpotPass keeping the interest ticking over. With Pokédex 3D, 3D Classics: Excitebike and Legend of Zelda: Link's Awakening DX, the eShop is off to a pretty good start. Love this app, it helps a lot especially since I am still missing some Unvoa. This could be a very helpful app. Great review James! A little question: Isn't it possible to see a simple list with every Pokémon? Or why can't you just click on a picture in the album and switch to this Pokémon? I love this app. My only complaint is that each pokemon stats aren't listend as ACTUAL POINTS. Instead we just get a couple bars indicating the general strength of the pokemon. That's not accurate! Is Nintendo gonna nickel and dime us for the other regional Pokedexes? Cuz I've got 15¢ right here! You know, I've never even played a Pokemon game but I like this app. It's fun to see what weirdo little 3D creature they're gonna send me next via SpotPass. Some of them have been AWESOME, like that Gear Pokemon they sent the other day. The Pokemon in this one range from cute to ugly to just plain bizarre and I like it. Too bad the old ones aren't in here... but I missed black and white, and now I can still see the Unova Pokemons. 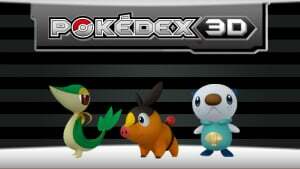 I guess I'll have to play Pokemon White on my DSlite if I want to use Pokedex 3D at the same time. Pretty ironic that you say Pikachu isn't here, cause you do get him after collecting all stickers. A must have for any serious Pokémon trainer! they actually plan on updating it apperantly as their is a update option, so in the forseeable future we may see other generations move to the pokedex along with numbers for the power of a pokemon and such and even better search tools. Possibley even dream world connectivity and the like or looking at leaderboards. Lots of possiblitys. 30 stickers lets you hear the Pokemon's cry during AR 50 lets you set a backround when you take pictures. More(can't remember the exact number lets you take pictures with other AR games. Like your Mii or Nintendogs. That would make me give the game a 9, but 8 is fair. 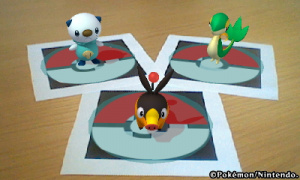 I'm enjoying the free pokedex 3D app. Here's hoping Kanto, Johto, Hoenn and Sinnoh pokemon are coming soon via future update. every day i get a new one just by being online this and DoA with their new downloadable costumes and challenges make my day every day the last week! A well deserved 8, I hope further updates unlock the National Dex. I can honestly say I don't really understand Pokedex. cant say im a pokemon fan. i saw the show with my kids, got annoyed at it a couple of times actually. they're called pokemon not monsters! can I use this 'Pokédex 3D' system in China? @keroro: if you've got internet access and a 3DS, it will be available to you no matter where in the world you are. thank you, theblackdragon. But, how can I get the internet access? well it is somewhat pointless, but it would be awesome to upgrade it to have all pkmn. still it's free and worth downloading. lol Totaly pointless and utterly useless for me. And even though I'm no fan of Pokemn, I LOVE most of the available Pokemon here, creative and funky stuff! But whatever, DELETE. This will most likely be the first thing I download on my 3DS. Back to the Pokedex app... As utterly useless and pointless as this application is (the statistics mean absolutely nothing to me), I still boot it up at least once a day just to see what type of monster/critter Nintendo will send me next. this is a fun app but you need some time collect them I started geting pokemon ever since the e shop came and I am still not even half way done so it is really slow but ok. I dont get it I scanned Tornadus' AR marker in my Nintendo Power magazne and he didnt show up,just his shadow??? Can anyone help? I wish it would give us their stats as they level up, instead of just giving bars.